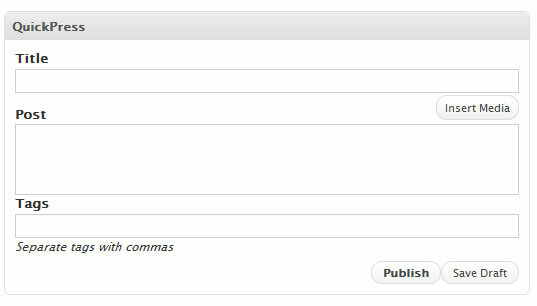 WordPress 2.7 Beta 1 is released for testing today. This release brings completely redesigned wordpress admin area, the design doesn’t resemble previous designs of wordpress admin. Some may like this and some may not, everything is looking pretty much rounded. There are some useful features implemented in this redesign. This beta 1 release will work with Firefox and Safari flawlessly, complete support for IE and Opera will come in the final release. Final release won’t be available on Nov 10th as scheduled but it will be ready by the end of Nov.
Another notable change and useful feature is QuickPress with which you can just publish a post quickly, quickpress is plain post editor with out any options. You can put title, post text, insert media and tags. 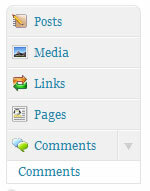 Write panel doesn’t change much except reordering of the elements. Publish, Tags and Categories are moved to right sidebar and these can be rearranged by drag and drop according to your taste. The most useful feature from this release according to me is this one, Plugin Browser/Installer. This will allow you to install plugins directly from WordPress plugins directory, you can search for plugins using keywords, or select the tags. The plugin browser page shows popular tags from official plugins directory, use those tags to get a list of plugins. Click install links from the plugin list and it will be installed immediately, there is no FTP thingy in this. This saves a lot of time and people who are not comfortable with FTP and other stuff will love this feature. The redesign brings some exciting features to the wordpress but some may not feel good with the sudden change in visual design. The Plugin installer and Quickpress are very good features in my opinion and with these nice features WordPress 2.7 is going to be one of the best releases of WordPress. Note: The screenshots are from my test installation, not from live blog. Looks pretty awesome. I can’t wait.